God: I consider myself blessed beyond measure. I'm may not the richest, prettiest, funniest...and on and on. None of that matters in to a kind and loving Father. Troubles have come and gone, and will likely come again, but I'm so grateful for a rock solid faith. It's what picks me up and gets me through. Family: Really. I'm just so very blessed in this area of my life. Wife Whisperer. 'Nuff said. Number One...a new grad of Texas A&M (whoop!). Number Two...two years of culinary school under his belt and working on the next two. I'm so stinkin' proud of them! My parents have been so supportive of me and my extended family, on both sides, is amazing. Love. Friends: This is a photo from April, of myself with my best friend, and neighbor, from...kindergarten. Kindergarten, people! I've known Kate Richardson for a very long time and hadn't seen her in probably 25 years. It was delightful seeing her again, in Oregon, and reminded me of the value of friends, both old and new. I've got some great ones! Students: This one really one that belongs in the "friends" category but I wanted to list it separately because it's so very important to me. I have the best students, in the world...really, I do! I love you guys so much. You never fail to inspire me, teach me and support me...no matter what! Thank you, thank you, thank you...a million times over. Living my passion: This is a biggie for me. I've always been a creative, "maker" type. I always wanted to be an artist. But, it seemed those two things weren't destined to come together earlier in my life. There is a time for everything, however, and when the time came for me to realize my dream, I grabbed it and ran. Dreams do come true. My small biz: I never really thought I would become a small business owner but, here I am. And I'm so blessed by it! I'm very thankful for the way my micro business has evolved. And, surprising to me...it's fun to be a micro business owner! Who knew? Travel: Believe it or not, I don't like to travel. I'm a home girl, at heart. I like eating dinner with Wife Whisperer and then sinking into the beanbag chair, for a movie. I'm ok with that, just about every night! But, teaching has allowed me to visit to some places that I probably wouldn't have seen, left to my own devices. I've mostly got over my fear of flying, although turbulence still terrifies me, and I'm very thankful to have had these opportunities. Hey...you students have made that possible for me! Again, thank you. As I look at this list, I'm realizing it's made up of intangibles...faith, love, trust, passion, joy. And isn't that the way a "thankful for" list should look? When we sit down for Thanksgiving dinner, I'll be thinking of the family and friends that weren't able to join us, at the table. I'll be thinking of how very blessed I've been throughout my life. I'll be thinking of the joyous moments and focusing on leaving the dark moments behind. I'll be thinking of you, my friends...I'm so thankful for you! Brand new from my studio...Altering the Past, mini class. I'm so excited to offer my first mini that will be available to students indefinitely. That's right! You buy it, it's yours to access for as long as you like. In this workshop, I show you my method for altering these treasures from the past: antique cabinet cards. Each and every one of them is unique and you'll learn how to make them even more special. For those of you who've taken my Artisan's Daybook online class, this is the cabinet card section of that workshop. I've been making these for years and really wanted to offer this as a class in it's own right. I think you'll be hooked once you try altering these! This workshop is available in my Etsy shop. Ok...I'm really thrilled beyond all words about this next thing. When the box came, I jumped around, did a silly dance and squealed like a little girl. Then I stripped off my shirt, plucked one of these babies out and slipped it on. Instant love! T-shirts! Yes, t-shirts! With my very own custom, designed-by-me, logo. Here's what they look like on a real, live person (sorry I had to cut you out, Julie!) I have to say, they turned out beautifully...even more pretty than I could have hoped for. The boho, shabby-chic logo is bright and clear and they fit true-to-size. I like to wear mine with a sloppy tuck at the front, and a leather or concho belt. I have a gorgeous Magnolia Pearl pink floral top that I'll be wearing, tied, over top. Yep! Just a little lagniappe (that's a small gift...a little sussie...in Cajunspeak) both sides of this t are decorated. I included a nice graphic, on the back. These are available through my Etsy shop in sizes S, M, L, XL, XXL. If the listing is sold out, please just contact me and I'll get one right up for you. 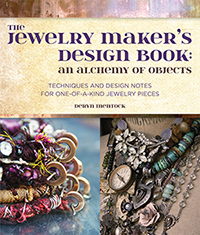 More news: I originally started my Jewelry Works blog as a place to offer my online classes. With the opening of my Something Sublime website, I've decided not to juggle quite so many balls, and close Jewelry Works. I'll continue to offer all of my online workshops, right here, on my blog. You'll also find info and links to them on my website. This shouldn't really affect ya'll but you may run into a dead link, here or there on the internet. If that happens, I apologize in advance! Just type in www.derynmentock.net (my website) or www.derynmentock.com (my blog) and you'll be whipped right back into my world. ...except maybe The Prairie by day. I've loved teaching in this peaceful and beautiful setting for several years now. This time, I decided to take a break and experience The Prairie as a student. These are the first classes I've taken in...well...I don't know how long. Years. There are lots of reasons for this but one of them is that I just don't have a lot of time for taking. I have to say, I enjoyed it so much. Who knew? It's good to be a student! Day one of classes was spent with Kim St. Jean in her pewter casting class. I'd met Kim, once before at Adorn Me in Houston, where we were both teaching. Needless to say, we didn't have time for more than one quick drink and then off to prepare...or sleep, which is it's own form or class prep! She's one busy gal and a delightful instructor who knows her stuff. The thing I LOVE about this process is that you can make elements that won't be seen in anyone's pieces but yours. I love that "unique" factor. This elk was cast from an antique bronze brooch that I found on one of my hunts. It's one of my favorite castings; also, the bunny. Of course, the trilobites and nautilus are right up my alley. Another favorite, this one was done with a rock and a leaf. A rock and a leaf, people. How cool is that? Days two and three were spent with the lovely Barbara Lewis. I have a big box of enamels and enameling stuff. I've done it before. I've read Barbara's book and taken her online class in an effort to prod myself into working more with enamels. Well...I watched her online class videos...of course, I didn't have time to actually do the projects. And, I never had time to pursue torch firing, again. Until now. I forgot how much I love it! These disks are going to be earrings. I discovered that white is my favorite color to work with. Who knew that simple white could produce such interesting results? Another favorite...don't they remind you of mercury glass or those old Shiny Bright Christmas balls? We had those on our tree, when I was a kid. They were this same color...and a little crackled. Take a gander at these lovelies. Transparent glass headpins. Love. One thing we did which I hadn't done before was enameling on brass. It's a gorgeous look on textured pieces. And here you see the back of my leaf piece...which is almost as pretty as the front. Lots and lots of fun was had and I got to spend a little time (a very little time!) with lots of amazing folks. I finally got to meet my gal, Jen Crossley, in person. So talented and what a delightful person. She had all kinds of amusing conversational quirks up her sleeve like calling dinner "tea." So cute. Love you, Jen! xxoo. Isn't Diane's ammo vest chic? Diane was almost as excited to finally meet Jen as I was. Funny girls! Here we are with the lovely Julie Panusis. This was the first time I'd met Julie...what a sweetie! Oh, btw...that's me in one of my new t-shirts. Love them and they're now in the shop! Here are some more of my gals...Yvonne, Rita and Diane. Always love being with them. This is an awful photo of me with my squinchy eyes but everyone else is cute...Cindy, Diane and Geri. Sorry I got pizza on your phone, Cindy. I think licking it off was a good solution. We didn't have any fun, did we? Oh yeah, my birthday boots made their debut at The Prairie. I'm going to have to stop getting older cause I don't have room to store any more. I thought this was just the coolest thing... When we came out of classes one day, there was the pizza guy with his rolling pizza oven. They took orders for individual pizzas and they were soooo good. Even the s'mores pizza...which I didn't think I would like...was delicious. That sticky marshmallow isn't easy to get off a phone...or a wineglass. Don't sit by me, like Cindy did. You never know when I might have a pizza incident. I'm unpredictable, that way. Bottom line: I really do just love The Prairie. Whether I'm teaching or taking classes. It's just such an enchanting place. This was the view from my bed...rain on the tin roof...poofy bed linens...sparkly mini chandeliers...and shabby chic goodness everywhere. I'm thinking I'll return to teach, next fall at The Prairie...I hope so! For sure, I'll be teaching for Vivi Magoo this February, in Tuscon, at Art Retreat in the Desert. I hope you'll check out my classes. If you've never been to this event, you're really missing out. I promise, it's one of the funnest times I've had teaching. Hope to see you soon!